� 20.09.2003 - Reefs from Kenya to Mozambique "dead by 2015"
afrol News / SciDev.Net, 1 July - The warming of Lake Tanganyika over the past century has made the lake less productive - posing a serious threat to fisheries, according to a new series of studies. The lake temperatures reached their highest levels in the past few decades, said the authors, something that could be attributed to man-made climate change. Although it was known that the lake's temperature has risen in the last century and also that productivity has dropped, the new study links the two and shows that the temperature rise is unprecedented over the long term. Scientists looked at lake sediments and reconstructed the lake's temperature and productivity over the last 1,500 years showing that none of the past variations has been as severe as the recent warming. 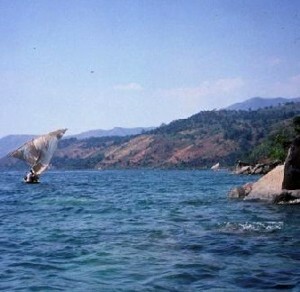 Lake Tanganyika is one of the oldest lakes in the world and the second largest, supporting a 200,000 tonne-a-year sardine fishery. Fish from the lake are a major source of animal protein for populations in the countries bordering the lake - Burundi, the Democratic Republic of Congo, Tanzania and Zambia - and provide employment for around one million people. "People throughout south-central Africa depend on the fish from Lake Tanganyika as a crucial source of protein," says Andrew Cohen, a US University of Arizona professor of geosciences. "This resource is likely threatened by the lake's unprecedented warming since the late 19th century and the associated loss of lake productivity," Mr Cohen adds. The decline in growth of plankton and algae - the basic and most critical part of the lake's food chain - is now threatening fish populations, endangering the livelihoods of thousands of people, scientists said. "Our data shows that warmer lake temperatures are associated with declining lake primary productivity [algae that grow in the lake] consequently affecting fish that feed on algae," said Jessica Tierney, a geologist and lead author from the US-based Brown University. "The rise in warming of the water surface has a big impact on those living around the lake, who depend on fishery as a food source and a means of employment," she said. The warming affects the surface layer of the lake, but not the colder middle and lower layers. This temperature difference slows down free flow of oxygen and nutrients that aquatic organisms need to thrive, said Dan Olago, a geologist at the University of Nairobi. The warmer the water, he said, the less oxygen it contains. "The fact that oxygen is reduced at lower levels implies that species living there die or multiply more slowly, negatively affecting the entire lake food chain and ecosystem," Mr Olago added. The studies were part of the Nyanza Project, which aimed to bring together and train tropical lakes researchers and students from Africa and the United States. The articles are published in the May and June editions of the scientific journal 'Nature Geoscience'.